Although the meat is not pre-cooked, it is ready to grill. Promotional value expires 60 days after purchase. Amount paid never expires. Reservation required 40 minutes in advance. Limit 2 per person, may buy 1 additional as gift(s). Valid only for option purchased. May be repurchased every 30 days. Limit 1 per visit. Merchant is solely responsible to purchasers for the care and quality of the advertised goods and services. Offer is not eligible for our promo codes or other discounts. There are few things more primal than eating morsels of grilled meat directly off of a pointy skewer. 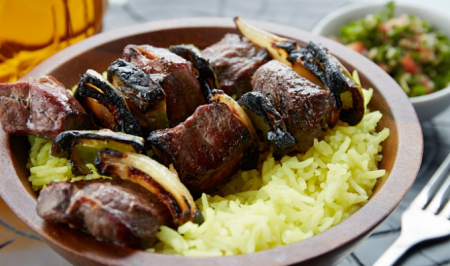 At Hanna Meat, chefs sizzle morsels of speared lamb, beef, and chicken over fiery grills, letting the flames kiss each bite until it’s lightly charred and tender. In addition to tackling these tempting kebabs, guests also haul away takeout feasts including savoury souvlaki and platters of delicate chicken wings.